The Walt Disney Studios celebrates the 60th Anniversary release of Walt Disney’s classic, “Peter Pan,” as it soars to all-new heights – with a new digital restoration and high definition picture and sound - for the first time on Blu-ray™. The classic tale that taught us all “to believe” and first introduced us to the Darling children – Wendy, John and Michael - as they flew with Peter Pan and Tinker Bell past the second star to the right and straight on ‘till morning to the enchanted world of Never Land. Rediscover the magical adventure and relive childhood memories of this great bedtime story. 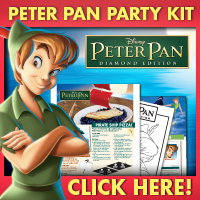 The “Peter Pan” Diamond Edition Blu-ray Combo Pack (Blu-ray + DVD + Digital Copy & Storybook App) is a “must-own” addition to everyone’s home entertainment collection, filled with high-flying bonus features for all ages that includes - the groundbreaking feature Disney Intermission, Growing up with Nine Old Men short film, never-before-seen Deleted Scenes and a never-before-heard Deleted Song. “Peter Pan” is a timeless classic from Disney’s Golden Age of animation. The film is one of three to boast all nine of Walt’s famous “Nine Old Men” as Directing Animators, and is a revered audience favorite. “Peter Pan” Diamond Edition 3-Disc Blu-ray Combo Pack will be available for a limited time only for the suggested retail price of $44.99 (US) and $51.99 (Canada) from Walt Disney Studios. One of the best movies I remember watching as a kid was Peter Pan. Not only did it make me feel happy to be a kid, but it brought my siblings and I closer to one another and this happened every time we watched this movie. So when I had the opportunity to bring this movie into my home and share this with my kids, who have never seen Disney's Peter Pan (they've seen Hook and watch Jake and the Never Land Pirates daily) I was more than excited. When watching Peter Pan on blu-ray not only was this experience better because I was watching it with my kiddos, but it brought so many memories of my childhood and how awesome it was to be a kid. The picture quality alone was amazing. The last time I had seen Peter Pan was on VHS, lol. This is definitely a movie you should watch with your entire family. If your kids haven't seen it yet they will absolutely love it and trust me when I say it brings back memories. 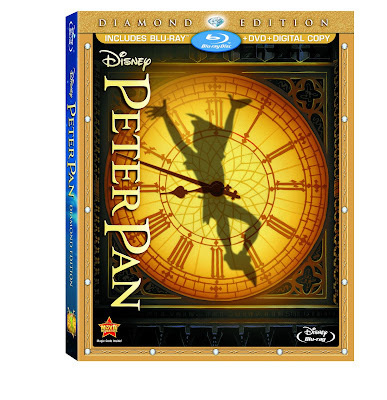 Get it while it lasts, starting TODAY, February 5th, 2013, Disney's Peter Pan Diamond Edition is out of the vault on Blu-ray & DVD combo. And you know once it's gone and back in the vault it's there until who knows when. Disclosure: All opinions are my own. 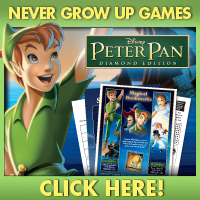 I received Peter Pan Diamond Edition at no cost for the purpose of this review. No other compensation was received.